NASHUA – In spring, Rivier University will again offer an entrepreneurial course to students, one which takes them out of the classroom and pushes them into the real world. The class has been offered to juniors and seniors for the last four years, while its popularity continues to grow. The class, taught by Associate Professor of Business Mark Meehan, is separated into teams during the semester to create a “double-bottom line” organization, which adds a focus on social impact. The organization must be financially sound and must contribute directly to the community. With this frame of mind, Meehan said the students realize their businesses have to be about more than just making money. “They begin to focus on businesses that are great for their community,” Meehan said. Last spring, students worked with officials in the office of Mayor Jim Donchess, Symphony NH, One Greater Nashua and other businesses. Throughout the semester, the teams work with business mentors from the community. Meehan tries to get the class off campus as much as possible to immerse students in the real world. Because of this, he generally receives positive feedback from the students. They get to see the difference of studying a business relationship out of a textbook versus meeting with someone, shaking their hand and sitting down to discuss a plan. Meehan said he is trying to show his students that entrepreneurship happens in the community. “It is a not a solo effort. You need to be in a community networking,” he said. He said MakeIt Labs, a nonprofit community workspace in Nashua, is a great example. “The whole thing is run by volunteers and it’s an incredibly vibrant space,” Meehan said. 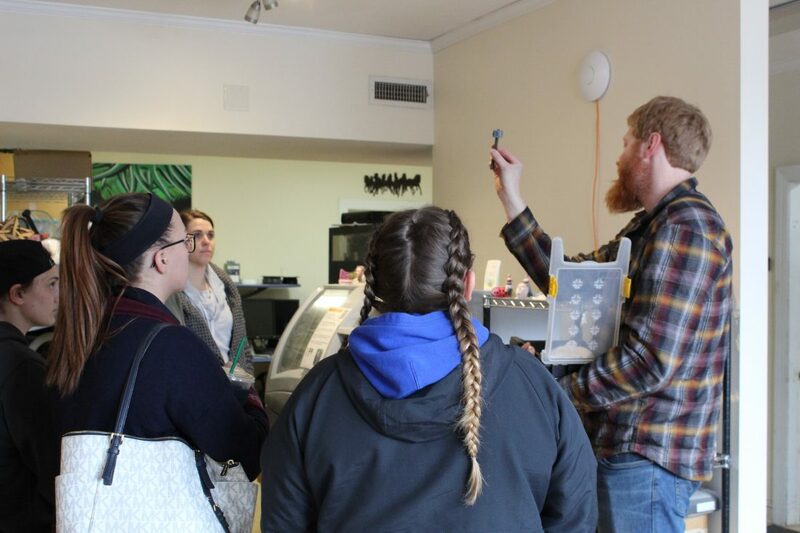 Students visited the lab Thursday for a tour from MakeIt Labs’ President Adam Shrey. Students were able to tour various parts of the space. They encountered 3D printers, robots, plasma cutters and speakbots, among other neat areas of the space. The students have not officially begun their projects yet. Meehan said the students have been working to determine the values of their potential businesses and figure which group member will be in charge of each task. While students were at MakeIt Labs, they had the chance to ask the volunteers questions. They asked one volunteer why he liked working there. He answered that there were so many different people to collaborate with whenever he needed help with a problem. Another student, Heather Jackman, asked Shrey what the process was when deciding whether to make the organization a nonprofit or for-profit organization. Another student asked about the organization’s process to avoid being sued, with so many pieces of technology that could cause accidents if not properly used, and another asked why they chose Nashua for location. The afternoon served as a way for students to see there are resources available to them in, essentially their own backyard. After the tour, Jackman said she loved the space. Jackman said the space was a great way to get different projects done that require use of expensive technology that one might not be able to otherwise afford. In terms of the entrepreneuriship course, Jackman said she had signed up because she had often done work as a “secondhand man,” but wanted to learn more about running a business and combining experiences with others. “Back in the 60s, 70s and 80s, people would hang out with neighbors and work on projects like these. 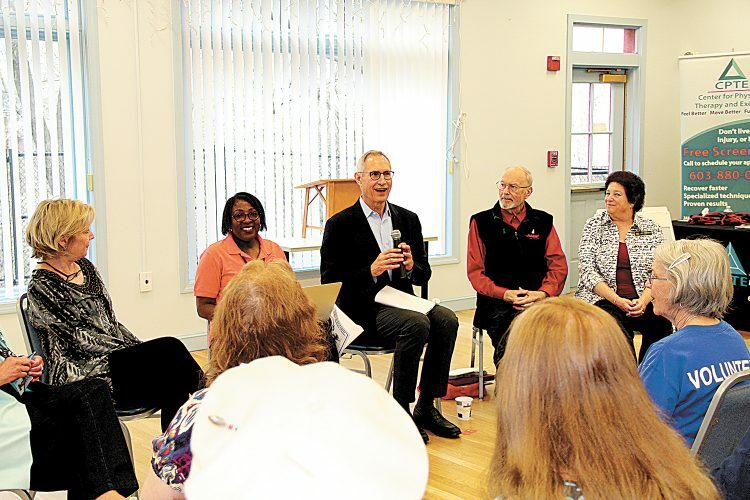 And here, you get a sense of community,” Jackman said. Frazer Brooks, a psychology major, signed up for the course to use his various skill sets. Brooks also enjoys carpentry, which allowed him to think creatively about how he might start a business. An idea he has is creating a space such as a trade school that would integrate into Nashua, through which people in rehab would be able to participate in carpentry. “When the hands are busy, the mind is not,” Brooks said. This course will conclude with a pitch contest on April 30, during which students will promote their business plans in five minutes to a panel of local business leaders. 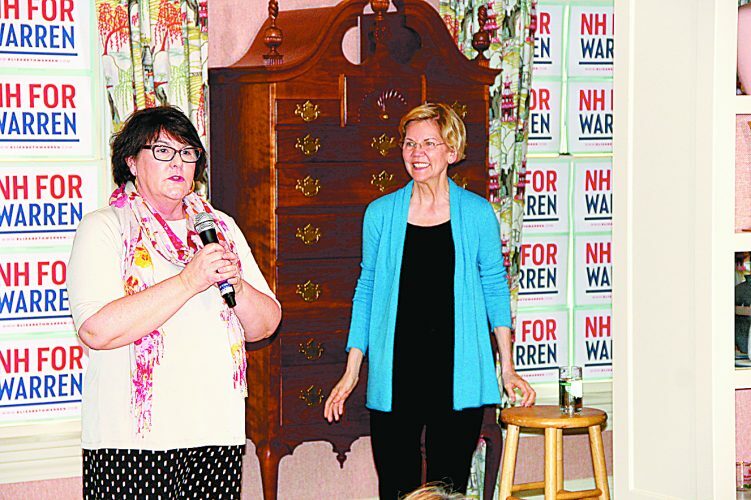 Meehan said the contest is done in conjunction with Small Business Week and the Greater Nashua Chamber of Commerce. The contest winner will receive a prize package consisting of office space, legal and financial consulting, manufacturing advice and cash. Grace Pecci may be contacted at 594-1243, or at gpecci@nashuatelegraph.com.